There are many good screen capture tools available on the web today. Some of my favorites are listed here. Today, I found a new screen capture tool that I like. 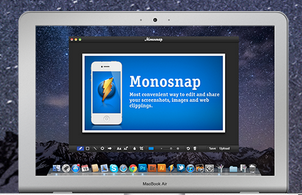 Monosnap is a new, free screen capture tool for Mac users. Monosnap is advertising that they will soon offer it for Windows, Android, and iOS too. To get started download Monosnap from the Mac store. Once installed you can use Monosnap to capture a portion or all of your screen. One neat option is to capture your screen after a ten second delay. After capturing your screen you can draw on your image, type on it, or highlight portions of the screen capture image. You can save your screen captures on your computer or upload them to a free Monosnap account. Monosnap, like other screen capture tools, could be used for creating directions on how to use a new program or application. If Monosnap does come through on the promise of Android and iOS apps it could be a great application to use to create annotated screen captures on those devices too.